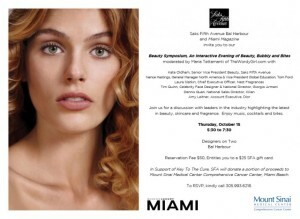 On Thursday, October 15, Saks Fifth Avenue Bal Harbour, Mount Sinai Comprehensive Cancer Center along with Media Partner Miami Magazine and Miami Fashion and Beauty Blogger Maria Tettamanti of TheWordyGirl.com present an interactive evening of Beauty, Bubbly and Bites highlighting the latest in beauty, skincare and fragrance. The lively panel discussion will feature leaders in the industry; Kate Oldham, SVP Beauty, Saks Fifth Avenue; Nance Hastings, GM North America & VP Global Education, Tom Ford; Laura Slatkin, CEO, Nest Fragrances; Tim Quinn, Celebrity Face Designer & VP of Creative Artistry, Giorgio Armani; Dennis Quan, National Sales Director, by Kilian and Amy Leitner, Account Exertive, Dior. Tastings provided by Makoto, Novecento Aventura, Morton’s The Steakhouse and Sugar Yummy Mama; cocktails provided by Southern Wine & Spirits of South Florida. 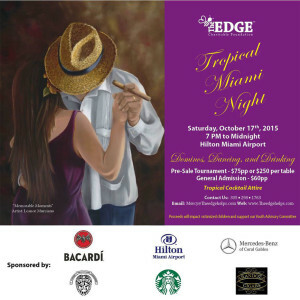 A portion of the proceeds from the evening’s event will benefit Mount Sinai Comprehensive Cancer Center; Thursday, October 15 from 5:30-7:30 p.m.
Join the EDGE Charitable Foundation’s 8th Annual “Tropical Miami Night Gala” on Saturday, October 17, at The Hilton Miami Airport Hotel, from 7:00 p.m. – 12 midnight. The domino themed event will raise funds to benefit children who are homeless, unaccompanied, and victims of human trafficking, domestic violence or victimized in any other way. Don’t miss your chance to experience a tropical island lifestyle where domino tables, cocktails, music and good company are essential. Pre-sale tournament tickets start at $75 per person or $250 per domino table. General admission tickets cost $60. To purchase tickets, visit www.TheEdgeHelps.com. The Habit Burger Grill in Miami is now open and serves fresh, made-to-order chargrilled burgers and sandwiches featuring USDA choice tri-tip steak, grilled chicken and sushi-grade tuna cooked over an open flame. In addition, it features fresh made-to-order salads and an appealing selection of sides, handmade shakes and malts. The Habit was named the “Best Tasting Burger in America” in July 2014 in a comprehensive survey conducted by one of America’s leading consumer magazines. French fries, onion rings, sweet potato fries and tempura green beans are 100% trans-fat free, cooked in soybean oil. The first Habit Burger Grill opened in Santa Barbara, California in 1969 and has since grown to 120 restaurants in 12 markets throughout California, Arizona, Florida, Nevada, New Jersey and Utah. The Habit Burger Grill Miami will be located at Fountain Square, 9971 West Flagler Street. More information is available at www.habitburger.com. New Theatre and Mina’s Mediterraneo have paired good food and entertainment in a joint venture dubbed PLAYte, a dinner theatre experience. Mina’s Mediterraneo, for $45 audiences will sip wine and dine on a chef selected three course meal in the restaurant’s inviting terrace. Choose from the Chef’s menu selection of 3 appetizers, 3 entrées and 2 desserts. After the reading they will be invited to participate in an engaging talk back offering invaluable insight for the playwright. 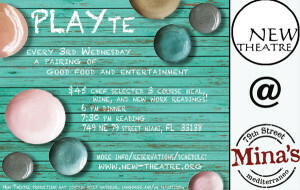 The Playte series takes place on the third Wednesday of every month – the next one is scheduled to take place on Wednesday, October 21st. For tickets or more information, visit www.new-theatre.org; New Theatre productions may contain adult material, language and/or situations. Beautiful fashions, better cause! Dadeland Mall invites the community to a Pink Party on Thursday, October 22 from 6-8 p.m.; throughout the event, shoppers will have the opportunity to shop retailer collections, visit sponsor tables, enjoy pink cocktails, experience make-up demonstrations, receive a complimentary gift bag and register for fabulous prizes! In honor of breast cancer awareness month, attendees are invited to leave a Message of Strength on the Dadeland Mall Tree of Hope. This message is an opportunity to show support for those in the community who have been diagnosed with breast cancer. Local blogger and stylist, Stephanie Pernas of A Sparkle Factor, will host the fashionable evening. As emcee, Stephanie will discuss fall trends from Dadeland Mall retailers and will offer style advice for every shape, style and budget. Free and open to the public.